Making delicious chocolates and having fun - the best experience for adults, children or companies! Here at The Choccie Drop I organise and run chocolate making parties for both adults and children, all of which are fun, interesting and hassle free, and use quality Belgian chocolate. You can book your own party (ideal for kids parties, hen parties or corporate events), or alternatively, you could come along to a pre-arranged event and join other chocolate-lovers. Whichever route you choose, you are guaranteed to have a fun time, and take home lots of delicious chocolates. The parties can take place either at your place (be that your home or workplace), or an alternative venue (such as hotel or church hall), depending on numbers. And don’t worry, it’s not that messy! A little bit about me, your Chocolate Expert Officer! 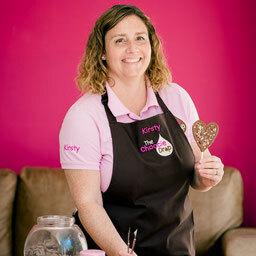 I’m Kirsty Stickland, Chocolate Expert Officer at The Choccie Drop. I’m married to Bob, and we have 2 girls at primary school. We live in Abbots Langley, Hertfordshire. I love chocolate (obviously!) and baking, plus I try to be a bit healthy so I go to pilates and play netball.